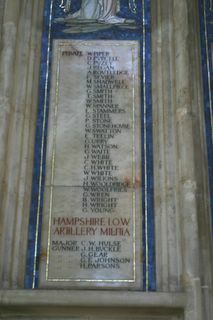 A series of marble panels giving the names of South African War casualties from the Hampshire Regiment and Other Units from the county, including those from the Hampshire I.o.W. Artillery Militia (Royal Garrison Artillery). The Memorial panels, and stained glass window, were unveiled and dedicated on 14th March 1904, by Lord Selborne, First Lord of the Admiralty. This is included because it names five men from the Isle of Wight.